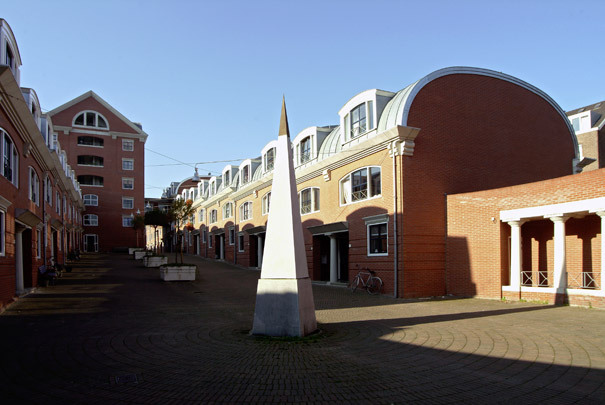 The work of the Walloon architect Charles Vandenhove, responsible for various urban regeneration projects in Liège, is very much at home in a similar city like Maastricht. Here the red brick, curved roofs and concrete classicist ornaments typical of Vandenhove have a homogeneous unity that weds well with the surrounding buildings. The houses sit in a courtyard drawn into the urban texture through two gateway buildings. Beyond the one in Capucijnenstraat is a circular plaza marking the entrance to an ascending pedestrian street flanked by housing and terminating at a block seven storeys high.